He relishes the experience of calling the shots. He is never a bundle of nerves in the sets and his eye for detail and willingness to put in extra hours to mould his output to perfection has won admiration and the hearts of movie lovers around the globe. 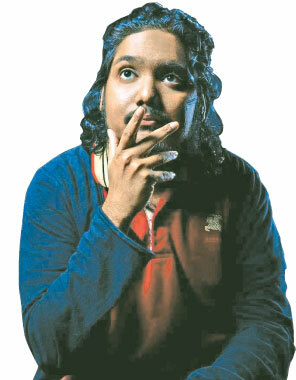 A director of Narrative Short Films, and Experimental Video, with a history of also working as a Still Photographer on feature films and music videos, Chaaritha Dheerasinghe has directed eleven short narratives some of which have won awards at reputed film festivals. ‘Shades’ a horror film was selected to be showcased at Blackbird Film Fest and the Hollywood Blvd Film Festival in 2017. His romantic drama, ‘The Girlfriend’ won the title of Best LGBT Film at the Los Angeles Cinema Movie Awards, 2018. ‘Kinghtfall’, another production based on a horror story, won Best Student Film Award and was nominated for the Best Actor and Best Screenplay at Feel the Reel IFF Film Festival the same year. ‘A World of Contradictions’ became a finalist and won the Best Actor and Best Actress awards at the Calcutta International Cult Film Festival (CICFF) and won the Gold Award for Best Short Film and the Bronze Award for directing at the Mindfield Film Festival in Albuquerque last year. “All my films are about one thing and that has always been the reason or, rather, the inspiration behind my films. It is people seeking a way out of forced solitude, or in other-wards loneliness,” Chaaritha explained. Not limiting his talents to film directing alone the 27 year old youth is also into set designing, script writing, digital and film photography Adobe Premiere Pro, Lightroom and fine arts such as portraiture and painting. He says that the knowledge in a variety of fields related to filmmaking gives one an understanding of what is physically possible. “For example I was the producer for some of my early work and now when I write, I know not to write in anything that wouldn’t be logistically possible for us to accomplish. I have also been an assistant director and as a result I know how many set-ups and shots a day a production can generally accomplish. Thus when I direct I know not to overwhelm my crew. Moreover, knowing photography helps me talk to the director of photography in a language that he understands. I have realized that my experience as an editor keeps me for wasting time on unnecessary coverage, and also keeps me from pulling my hair and going crazy when we watch our dailies -because a shot, or performance that might not work individually has a chance of working brilliantly when in-sequence,” he said. An old boy of S. Thomas’ Preparatory School, Colpetty, Chaaritha moved to Walter Johnson High School in Maryland, USA, to obtain his High School Diploma. He has a Bachelors of Fine Arts (BFA) Degree in Cinematic Art from the University of Maryland, Baltimore County, Maryland, USA and a Masters of Fine Arts (MFA) Degree in Film Making from New York Film Academy, CA, USA. He has an Associate Degree in Fine Arts from Montgomery Collage, Maryland, USA, as well. Chaaritha says that the experience of collaborating with creative minds is what excites him about filmmaking. “I enjoy working toward a common goal in coordination with a team. I also like pictures. I used to paint quite often, but eventually grew tired of spending much of my time alone in a studio. However it did give me a sense of discipline, and concentration, which still helps me when I work as an editor,” Chaaritha said. He names ‘The Crimson Smile’ - which is still in post-production - as his favourite out of all his productions. “My liking it has nothing to do with the story or such. Perhaps some of my other films have better stories. It simply has to do with my newly found philosophy in regards to short films. I believe short films should be short and concise, and my latest short film embodies this philosophy. It doesn’t feel like a feature crammed into a short. The understanding I have now is that a short film must be like a short story. It is its own medium not one that is inferior to the feature - and certainly not a marketing tool to secure funding for extra scenes, to make a feature. Just like short stories are their own thing, so are short films,” Chaaritha opined adding that he doesn’t count great sound and a pretty picture as qualifiers for quality short films. His most memorable moment in filmmaking is, however, related to ‘Trash’ because he was happy with one of his productions for the first time when he watched its edited version. Reflecting on one of his most challenging moments in filmmaking Chaaritha says that at one time in down town LA the security were not letting the team into their location. This was because the location owner had misinformed them about the date of their arrival and had subsequently left for a vacation in Hawaii. “My producer was able to somehow contact the man and we were let in, but by the time that happened we had lost over three hours of sunlight! I had to revise my shot list and floor plan on the go. It was undoubtedly a hectic day, but I was gifted with a tough cast and crew, and we made the day without a fault on our part,” he said with a smile. Chaaritha hails from a family which is into banking. 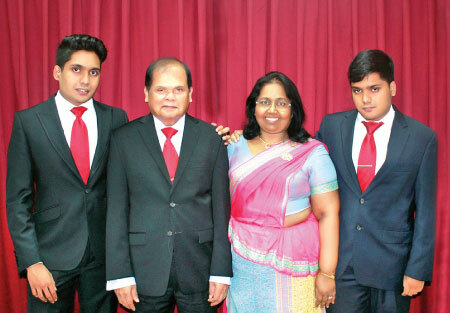 His father, Dharma Dheerasinghe, is the former Deputy Governor of the Central Bank of Sri Lanka and the current Chairman of the Commercial Bank of Ceylon PLC. He is also a Past District Governor. His mother, Rupa Dheerasinghe, is a former Assistant Governor of the Central Bank of Sri Lanka. Her time is mostly devoted to social work now. She is also the Immediate Past District Governor of Lions Clubs International District 306 C1. Chaaritha has a twin brother, Usitha Dheerasinghe, who works in the field of digital marketing. Chaaritha says that he admires many diferent filmmakers for different reasons. “There are so many different components to filmmaking. It is really hard to name just one filmmaker who has inspired me. I love the work of Italian filmmaker Michelangelo Antonioni for his rather geometric framing, fluid camera movement, and character driven films. Ashoka Handagama’s minimalistic style, and drive to give prominence to the image (and action) over lengthy dialogue too is stimulating,” he said adding that his ambition is to grow beyond filmmaking. He is currently developing his debut feature film. It is a story set in Sri Lanka, and would star local talent. “Get to know people who are already part of industry before you pick the field. Through them you would be able get on set and see what it is really like, and this would also give you access to talent and insider-knowledge. Perhaps with the exception of writing, never ever attempt anything alone. Simply scout for talent - not just for actors, but most importantly crew. 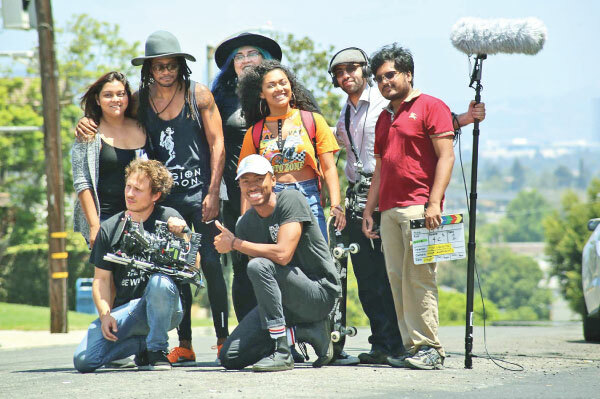 When you are an independent or student filmmaker you need to do a bit of producing yourself, and in the process develop an eye for recognizing talent in others. This is more important than being talented yourself. If you want to direct, learn to do a shortlist, and an overhead. 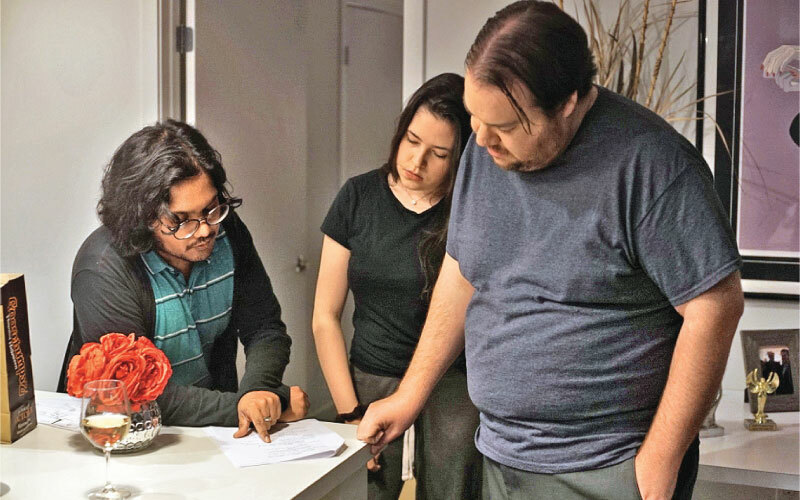 Meet with your key crew and have a production meeting before the day of shoot - learn what is expected of your assistant director because he runs the set, and not the director. When directing avoid result oriented direction. Simply give actors their (character’s) objective within the scene. Also remember to come to the set having rehearsed the scene before hand given the scene is discovered in the rehearsal,” are his words of advice to upcoming young filmmakers.